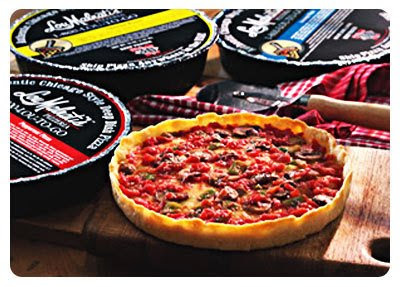 Winner of Foodie Freebie Friday: Chicago Style Pizza! Well, here we are again... Foodie Freebie Friday! Hope you all had a great week and are looking forward to a fun weekend ahead. This week I asked readers to share what their favorite pizza toppings were. I can't tell you how excited I am to have a pizza party soon just so I can try all the wonderful combinations that were mentioned! Some ingredients mentioned that I have yet to try on a savory pizza included sauerkraut, pignoli (pine) nuts, almonds & cinnamon, figs and fried eggplant. Day 1: Piece Pizza - Rachel Ray from the Food Network had featured this pizza place in her Tasty Travels show. The pizza here is a New Haven style and with so many various toppings and sauces to choose from, you'll definitely find one you'll like. We ordered a White Pizza (a plain crust brushed with olive, diced garlic and mozzarella cheese) topped with fresh baby spinach and grilled chicken. Day 2: Marie's Pizza - This is a favorite of mine because I like super thin (like crispy cracker thin!) pizza. They have one of the best in the city in my opinion and we topped ours with a classic cheese and sausage. Day 3: Burt's Place - Burt and his lovely wife did us in. They also had the pleasure of feeding Anthony Bourdain not too long ago when he was in town filming some Chicago spots for his show, No Reservations. One thing I love about Burt's place is that it's not your typical pizza place. It's truly like visiting Burt's house and eating in his living room that's been filled with tables. His wife was our server and it was a great to have the place to ourselves at one point. Burt and his wife came out, sat down with us and we all talked a bit about Anthony Bourdain's visit and about his business. But back to pizza... Burt's puts out a great Chicago style deep dish that has a caramelized crust that he's known for. It was amazing and after his pizza, we were done with our Pizzathon. It was the icing on the cake! Click on the link to see the video of Anthony Bourdain's visit to Burt's! Hmmm... maybe I'll have pizza for lunch today consider all this talk about pizza! 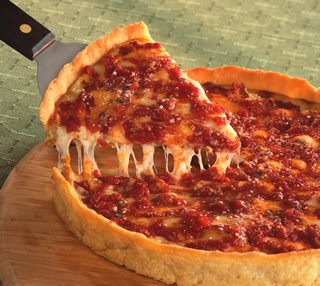 But before I do, let's find out who's going to be enjoying some Chicago style deep dish pizza from Lou Malnati's! One lucky reader will get their pick of what pizzas they want from this site. Congratulations Nikki! Please email me at [email protected] so I can have your pizza package sent right away! Thanks again to all those that commented and stay tuned to the next Foodie Freebie announcement on Monday, Arpil 20, 2009! Don't feel discouraged if you haven't won yet - I have a whole year's worth of freebies ahead and next week is one that you won't want to miss! Pizza, hmmm, cant go wrong with pizza. How I miss Chicago deep dish - we had Malnati's, Uno's, Giordano's and Gino's East. Ah, memories! I am pretty sure my husband could eat pizza a couple of times a day for a week or two before getting tired of it! :) I can't go that long, but this post definitely makes me crave some! All this talk about pizza is making me drool! Glad to see you've found Marie's! It's my fav (sausage and pepperoni only!). LOVE the decor too - I'm quite certain it hasn't been updated since 1970.